Pinnacle Staff Attends Love and Logic Training | The Pinnacle P.O.V. 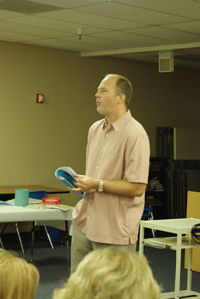 This past September, Pinnacle Online High School held a staff development day with guest speaker, Jedd Hafer. The purpose of the training was to examine other types of communication “tools” for dealing with our student population. Our speaker, Jedd Hafer, is from Love and Logic and is the owner of a Rehabilitation Facility in Colorado. The experiences he shared with us are the very same things we deal with on a daily basis. His knowledge and expertise was very beneficial to the Pinnacle staff. One can never have too many “tools” from which to choose! We are not alone in our quest to communicate and connect with students. If we can communicate and connect with them, we have a better chance of guiding and steering them toward earning a high school diploma! If Love and Logic has a formula that works for them, we wanted to see if there was anything we could pick up and use for our own students. All in all, it was a very full day, but one in which everyone got something they could use out of it. The communication “tools” Hafer showed our staff will work with our students, one’s children, significant other, disgruntled parents, etc. To learn more about Hafer and Love and Logic, visit their website at www.loveandlogic.com. ~ by pinnaclepov2224 on October 19, 2009.